Being Frugal and Making It Work: My Swagbucks Story: FREE Gifts for my Kids Every Birthday & Christmas! My Swagbucks Story: FREE Gifts for my Kids Every Birthday & Christmas! I post about Swagbucks rather often... The reason I share is because I love Swagbucks! Since joining, I have been able to get my kids some AMAZING gifts at no cost. That's right, FREE GIFTS! The best part is that the points you earn can be used to get free gift cards to places like Amazon, Starbucks, Walmart, Target, PayPal cash, and many more! Trust me, Swagbucks actually works - I currently earn between $50 and $70 each month and it really adds up. Once I redeem my Swagbucks for a prize, it takes less than a week for them to arrive in my inbox. I'm always impressed with how quickly they send our rewards. I "bank" and save my rewards all year long and redeem them for "FREE" Birthday and Christmas gifts for the kids! The kids are always thrilled with their gifts and I'm happy that I was able to stick to our holiday budget and not break the bank! Christmas 2010, I was able to use them for the one thing my son had been asking for... a metal detector! Yep, that's right... I didn't have to spend a penny out of pocket, it was FREE! For Christmas 2011, I redeemed my FREE Amazon.com gift cards I had earned through Swagbucks and chose the LEGO Grand Emporium for my daughter, a $150 item and a Steelers Team Signed Football with certificate of authenticity, a $159 item for my son. 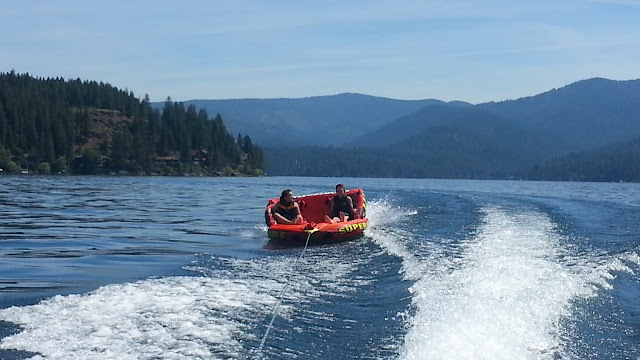 Summer 2012, I purchased a $250 tube for us to pull behind our boat. It's been a huge hit and we are still loving that FREE item... all thanks to Swagbucks! I've even purchased a few items for my husband, myself, our vehicles and our house. If you aren't already a member of Swagbucks, you really should JOIN ME and start earning FREE REWARDS of your own! May Swago Pie Fest is Here! Join for FREE! Swag Wars Team Challenge - Join Me Today!